Not cartoons! Cardoons, a vegetable that turns up at the festive Christmas Eve meal in Spanish homes. Known as cardo in Spanish, the cardoon and its close relative, the artichoke, are thistles. Of the artichoke, it is the flower bud that is eaten; of the cardoon. it is the tall stalks. The first time I ever saw cardoons was in the still-life paintings by Juan Sánchez Cotán (early 17th century). 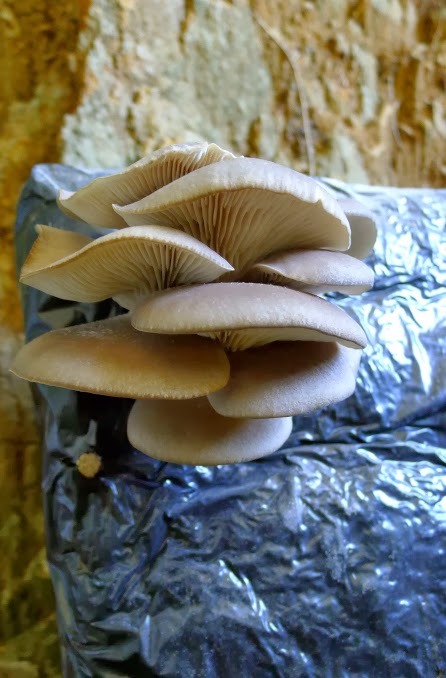 Structurally interesting, but are they edible? Cardoons are grown in the northern regions of Aragón, La Rioja and Navarra, so that is where this vegetable is most popular at Christmas. But, last week when I spied the stately stalks at a local grocery store, I couldn’t resist having a go. 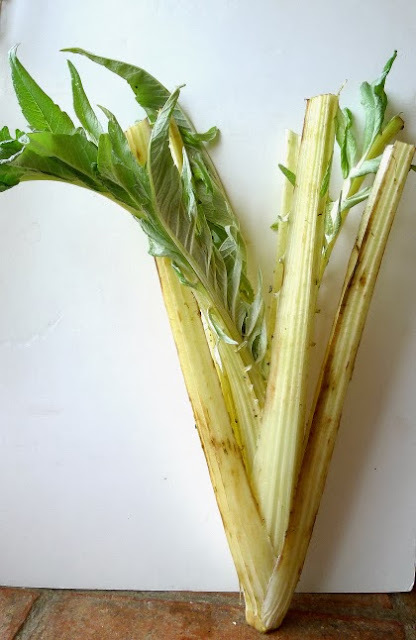 Like artichokes, cardoons require quite a lot of prepping—stripping off prickly leaves and trimming away fibrous strings (much like celery). Next time I want to serve this unusual side dish, I’ll buy the cardoons en conserva, in jars, cleaned and cooked, ready for saucing. 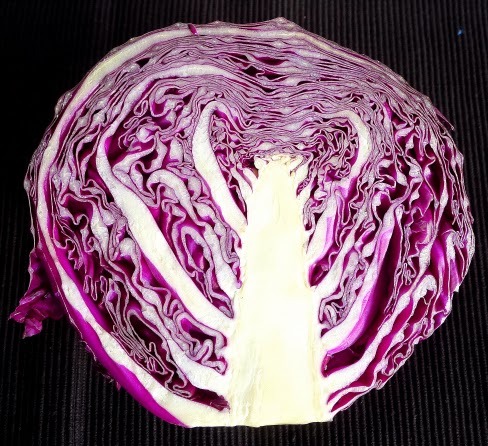 Another traditional vegetable at the Spanish Christmas table is col lombarda, red cabbage. Years ago, when I was doing a magazine article about how Spaniards and foreigners celebrate the holidays, I interviewed a Danish woman married to a Spaniard. 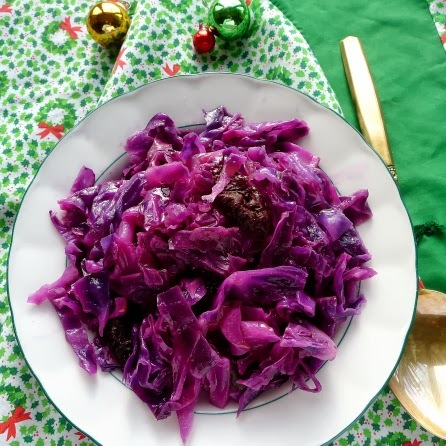 With Christmas customs, she said, red cabbage was their only point of convergence—traditional for Christmas dinner both in Denmark and at her Madrid mother-in-law’s table. 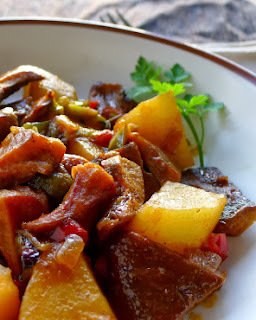 This vegetable is easy to prepare and adds festive color as well. Red cabbage goes especially well with roast pork, venison or goose. Red cabbage adds festive color. 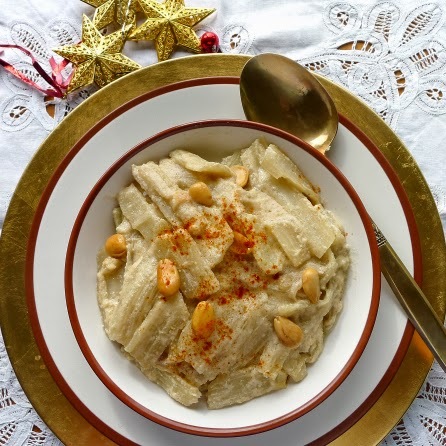 Cardoons with almond sauce, a side dish for Christmas. Place the juice of 1 lemon in a bowl with about 4 cups of water. Cut the other lemon in half. Stir 1 tablespoon of the flour into ½ cup of water and add it to a large pot with 8 cups of water and 1 ½ teaspoons salt. Squeeze ½ lemon into the pot of water and add the lemon too. To prepare the cardoons: Discard hard outer stalks. 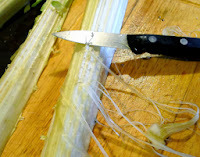 Separate all the stalks from the base. Use a knife or vegetable peeler to remove the strings on the outside of each stalk of cardoon and the thin skin on the inside of the stalks. Rub each stalk as it is peeled with the cut lemon. 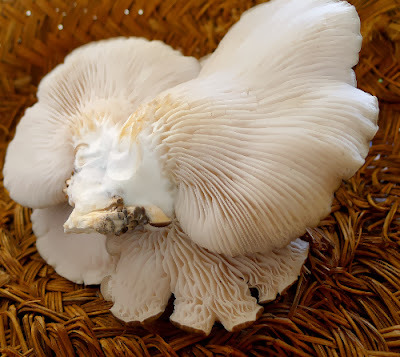 Cut it into 3-inch pieces and drop them into the bowl with lemon juice. When the cardoons are prepared, bring the pan of water with the flour and lemon juice to a boil. Add the cardoons, cover and simmer until the cardoons are tender when pierced with a knife, 45 to 60 minutes. Remove from heat and allow to cool in the cooking liquid. If cooking the cardoons in advance, refrigerate them with the cooking liquid. Drain well before proceeding with the recipe. Heat the oil in a skillet and fry the almonds and garlic until they are lightly toasted and golden. Skim them out. Set aside a dozen almonds to use as garnish. 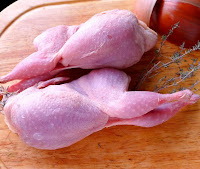 Place the remainder in a blender with the garlic and some of the chicken stock. Blend until smooth. Stir the remaining ½ tablespoon of flour into the oil in the skillet and let it cook for 2 minutes. 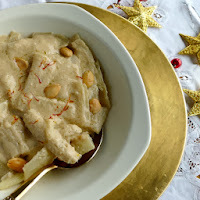 Stir in the drained cardoons, the almond mixture from the blender, the remaining stock and ½ teaspoon salt, or to taste (if stock is salty, take care not to over-salt the sauce). A few threads of saffron top the dish. Cover and cook the cardoons gently about 30 minutes. Place in a serving bowl and scatter the reserved almonds on top. Serve hot sprinkled with pimentón (paprika) or, for an opulent touch, a few threads of golden saffron. 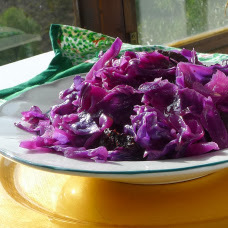 Red cabbage with prunes, another good side dish for a holiday meal. Red cabbage needs an acid ingredient—wine, citrus or vinegar—to keep its vibrant color while cooking. Adding sweet fruit such as raisins or prunes balances the acidity. Cut out and discard the core. Shred the cabbage and set aside. Heat the oil in a pan and sauté the onion for 3 minutes. Stir in the shredded cabbage and let it sauté 1 minute. Pour over the wine and mix well. Add the prunes, water, salt and pepper. Cover and simmer, stirring occasionally, until cabbage is cooked to taste—20 minutes for slightly crunchy, 40 minutes for very tender. Good with turkey, goose, pork or venison. Looking for more about what Spaniards eat for Christmas? Have a look at Kaley’s blog. She’s a young American married to a Spaniard and living in Madrid. 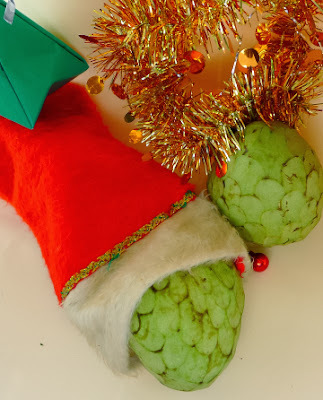 ¡Felices Fiestas! Happy Holidays. 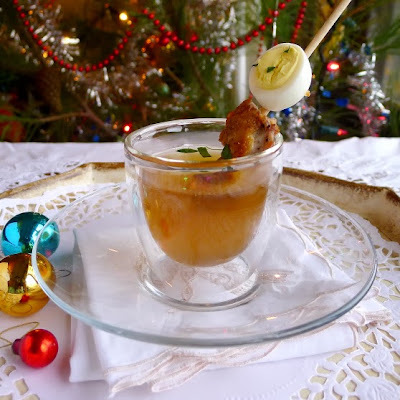 I hope you enjoy all the wonderful foods during this festive season. 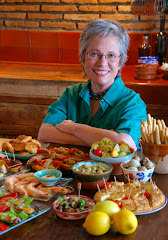 Just when I was supposed to be slaving over a hot stove, preparing a recipe for this week’s blog, I got a phone call from Shawn Hennessey, “tapas queen,” my guide to tapas in Sevilla (see her web site http://sevillatapastours.com/ and also my recent blog post from Sevilla). 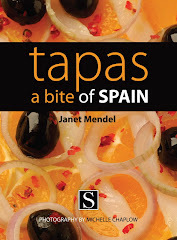 She has been visiting Málaga and revisiting her favorite tapa bars there. “I’m coming to Mijas! Can we meet at lunch for tapas?” I’m so excited that Shawn is meeting me on my own turf! (I live in Mijas.) So, of course, I drop everything. Mijas is a small hill town overlooking the Mediterranean on Spain’s southern coast. It once had a dozen tapa bars in the casco antiguo, the old center. Of those, only two remain. But it has a dozen new bars, some mainly serving the day tourists, but others with ambitious wine lists and menus. Bar Porras in the central plaza of Mijas. 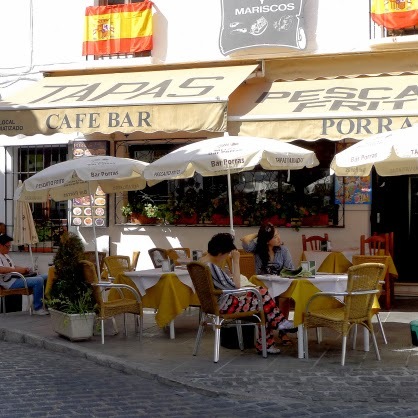 We meet at the Bar Porras, on the Plaza de la Libertad, smack-dab in the center of town. Bar Porras is one of the original bars, where I learned Spanish cooking some 40 years ago.This is where I have coffee and read the newspaper most mornings after my aerobics class. Shawn arrives with Victor Garrido, an independent tour guide who does in Málaga what Shawn does in Sevilla (http://www.welovemalaga.com/ ). 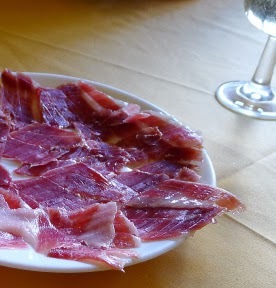 A plate of ham to begin our tapas lunch tour. 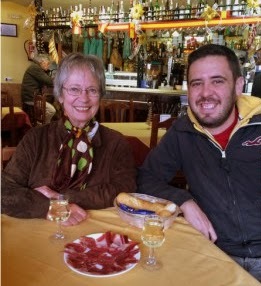 Having learned the tapa-tour-guide plan from Shawn, I immediately order a plate of ibérico ham and glasses of Manzanilla (fino Sherry). We are off to a good start. Cheese and a glass of Botani. Shawn is delighted to find here her favorite white wine, the light and floral Botani, from Bodegas Jorge Ordoñez. 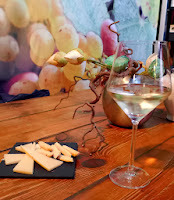 The Museo del Vino specializes in wines from Málaga province. The wine pairs perfectly with a nutty, semi-cured cheese. We are served bread rolls and bread sticks and a dish of organic olive oil for dipping. Grilled scallops and cherry tomatoes. 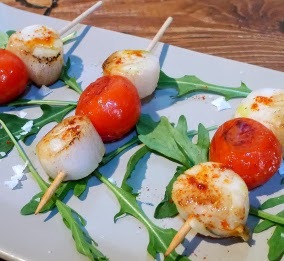 We share a tapa of grilled scallop brochettes with cherry tomatoes. 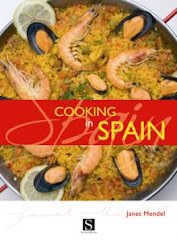 A sprinkling of pimentón (paprika) and olive oil complements the sweetness of the shellfish. Likely the scallops are frozen—but they are, nevertheless, delicious. A last stop before Shawn returns to Málaga to catch her train back to Sevilla. We perch on stools (not very comfortable) at Bodega El Placer, just off the central plaza. Touted as a “wine bar,” it seems to specialize in red wines and does not have Shawn’s favorite whites. We sample several tapas here. I love the squid croquettes with a squid-ink alioli sauce. They are black and crispy on the outside, creamy on the inside. Think I will try this recipe myself one of these days. 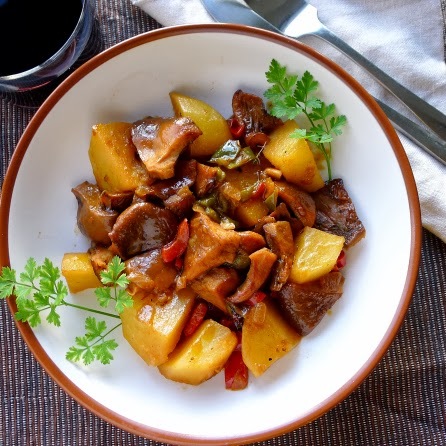 Solomillo (pork tenderloin) is—in my opinion—too sweet with a fruit compote. The crispy langostinos tempura—jumbo shrimp, crisply fried—are divine, but again, a little too sweet in the saucing. 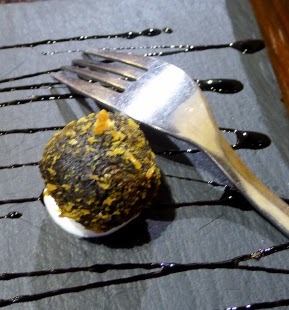 Morcilla (blood sausage) doesn’t show any evidence of the raisins and pine nuts that supposedly accompany it. The bacalao—salt cod—gratin is, uh, interesting, with its dusting of curry and turmeric, but again, with a layer of sweet compote that overwhelms the other flavors. What's with all the sweet sauces? 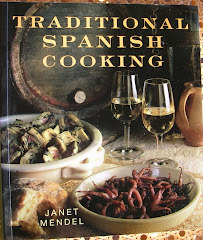 They are not really traditional in Spanish cooking. Ham, egg and crispy fried potatoes. Terrific! The best dish of all? A perfect—perfect—fried egg. 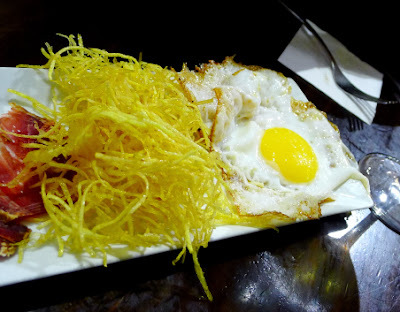 Estrellado—crispy around the edges, with straw potatoes, hot and crispy, and some meltingly tender scraps of fine ham. How to share this amongst three? Shawn, with enormous experience, proceeds to mix the egg, ham and potatoes all together. Oh my god, that is so good. Thanks Shawn. Come back soon. Exoticica--sweet cherimoyas, ready to eat. I once lived in an old house in the village with a big, overgrown garden behind it. Stone dry walls divided the sloping garden into terraces, on which were planted many trees. Olive, fig, both orange and lemon, peach, pear and apricot, all those I could identify. Others, such as the pomegranate with its flamboyant red flowers, were new and exotic to me. 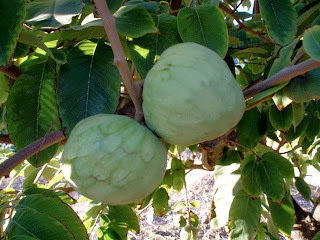 One tree with broad, swishy leaves in early winter produced large green, heart-shaped fruit with a faceted surface that made them look like hand grenades. My neighbor, who pointed out the fruit to me, said they were chirimoyas. 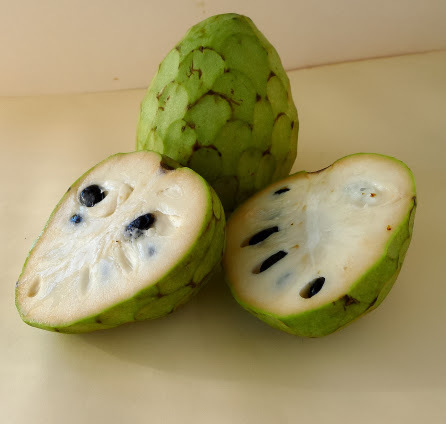 Eventually, I learned that the fruit actually comes from South America and that, in English, it is called cherimoya or custard apple. Highly perishable and with a short season—November to January—cherimoyas are not widely commercialized. Best to enjoy them where they grow. 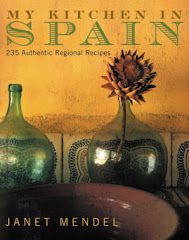 And, where they grow is right here, the southern coast of Spain, from Gibraltar to Almuñecar (Granada). Cherimoyas from the Granada coast have DOP—protected designation of origin—Chirimoya Costa Tropical. 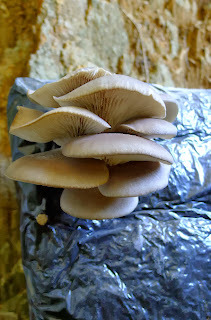 Inside the thin green skin, the flesh is creamy-white with shiny black seeds throughout. It tastes like a really sweet and creamy lemon-pineapple pudding. The aroma is “tropical”—banana, papaya, mango, all rolled into one, but subtle. The texture, like some pears, is slightly grainy. Did I say? really sweet. When ripe, the skin and flesh darken. Buy (or pick) cherimoyas when they are still firm and allow them to ripen until the green skin begins to darken in patches and the fruit, when gently squeezed in the palm of the hand, shows a little give (just like you test an avocado for ripeness).Small ones, as shown at left, ripen very quickly (two to three days). Spoon the flesh from the skin. The best way to eat this fruit is to cut it in half and spoon it right from the shell. The tongue and teeth easily deal with seed removal. Just spit the seeds out. Nothing simpler. Yet, such a fabulous fruit certainly deserves something fancier. And, so, this season, I began seeking the perfect cherimoya dessert. I’ve done sorbet, I’ve done mousse. Looking through online recipes, I liked the ideas of Pavlova with Cherimoya (meringue layers filled with fruit puré and whipped cream); Cherimoya Smoothie; Cherimoya Soufflé. The chef on Cómetelo (Canal Sur TV) made a scrumptious looking cherimoya flan with white chocolate sauce. 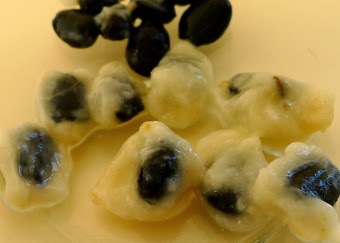 I loved his clever idea of dipping almonds in melted dark chocolate and scattering them around the finished dish so that they looked like shiny black seeds from the fruit. I wanted a festive dessert in which the fruit could shine all on its own. A creamy tart? As the cherimoya pulp is so smooth and creamy, I needed something crunchy or crisp as contrast. How about a crumb crust? Yes! 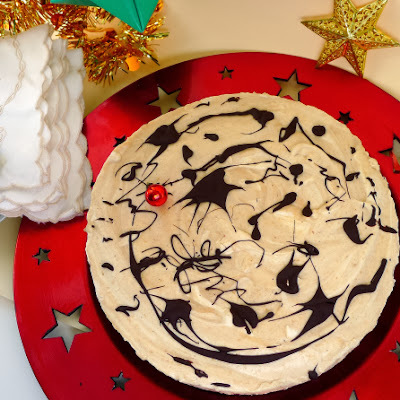 And some melted chocolate to dribble over the top to add a luxurious touch for the holidays. Seeds are not easy to remove. Now, about those seeds again. Each one is enclosed in a fleshy cell and does not easily separate from the flesh. I tried rubbing them through a sieve and that didn’t work either. You pretty much have to use a knife or fingers to extract each seed. Yeah, that’s a drag. But, once a year, worth the trouble. I did find that, the riper the fruit, the easier to squeeze out the seeds. Add lemon juice to the fruit pulp to prevent its oxidizing. 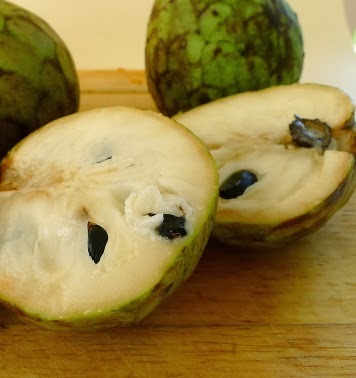 Because the cherimoyas are so very sweet, you will need very little sugar to make the tart filling. I used none at all. Taste the pulp and add sugar to suit yourself. Cherimoya tart, a festive holiday dessert. The tart filling, which is set with gelatine, can be made a day in advance of serving. It also freezes well. If frozen, allow to stand at room temperature at least 15 minutes before slicing and serving. 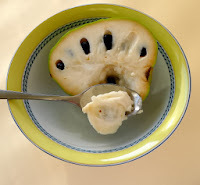 Cut the cherimoyas in half and scoop out the flesh. Remove and discard all the black seeds. Puré the flesh in a blender or food processor with the lemon juice. Place in a bowl and stir in the lemon zest, cardamom, Sherry, yogurt and sugar. Put the milk in a small bowl and sprinkle the gelatine into it. Allow to soften for 5 minutes. Dissolve the gelatine in a microwave or by placing the bowl in a pan of hot water and stirring. Whisk the gelatine into the fruit mixture. Beat the cream until it holds soft peaks. Fold the cream into the fruit mixture. Pour the mixture into the spring-form mold lined with baked crumb crust. Refrigerate the tart for at least 8 hours. Run a knife around the edges of the pan and remove the sides from the pan. 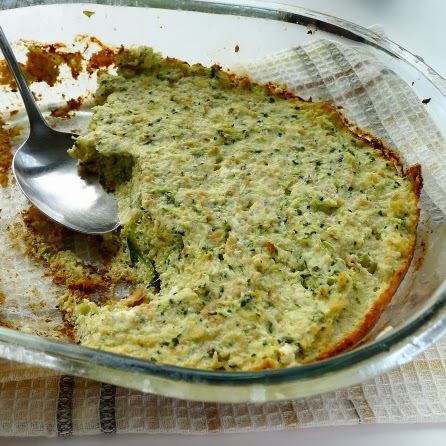 Carefully loosen the crust from the bottom and place the tart on a serving dish. If desired, dribble melted chocolate over the top. 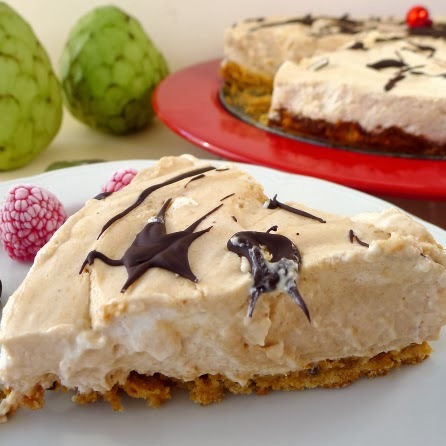 Chocolate adds a luxurious touch to cherimoya tart. Use any favorite crumb crust recipe. I invented this one because I had some leftover pieces of marzipan (almond-sugar paste). In a food processor, grind the crumbs finely. Add the marzipan and process until combined. Add the egg white and process to a paste. Spread the mixture in the bottom of a spring-form pan that has been lightly greased with almond or olive oil. Bake the crust until golden around the edges, 10 minutes. Remove and allow to cool completely before adding the filling. Two kinds of sweet potatoes, orange and white. In the US, Christmas has to wait, at least, until after the Thanksgiving holiday. In Spain, without that cut-off date, Christmas decorations and foods begin to appear early in November. Already the boxes of special sweets are stacked in shops, hams (serrano and ibérico) are stocked and awaiting the buyers, glittery decorations and lights gleam in shop windows. 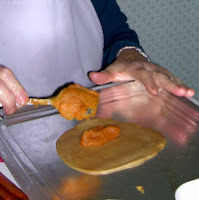 And, my village neighbors are already making empanadillas—fried turnovers with sweet potato filling, a Christmas treat. 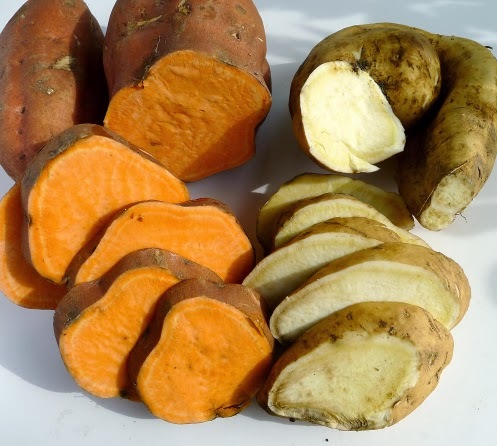 Both orange-fleshed and white sweet potatoes are found in Spanish markets. 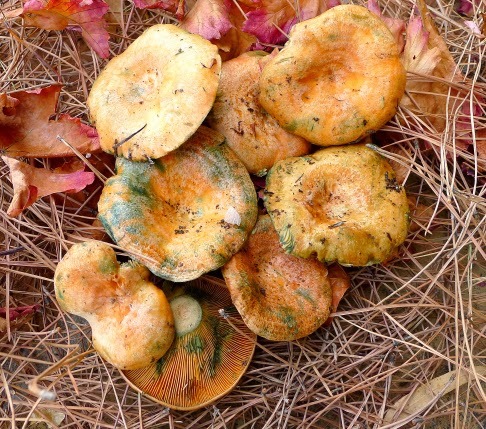 The orange ones are sweeter and have a more pasty flesh; the white ones are mealy, somewhat like regular potatoes. My kids, when they were in primary school in the village, ate lunch with a Spanish family (no school lunchroom in those days). 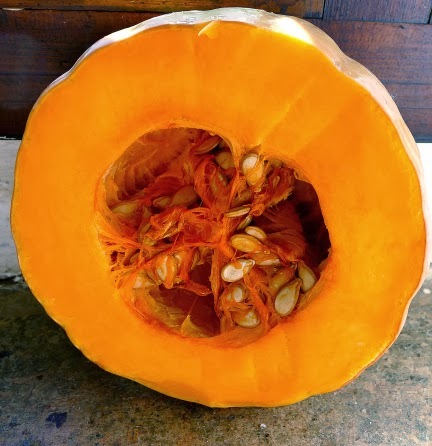 This time of year, they often had boiled sweet potato for dessert or snack—no added sugar, just the sweet flesh spooned out of the skin. Although I’ve lived 40 years outside of the United States, I still like to celebrate Thanksgiving, an occasion for feasting, for getting together with friends and family, for enjoying harvest foods. 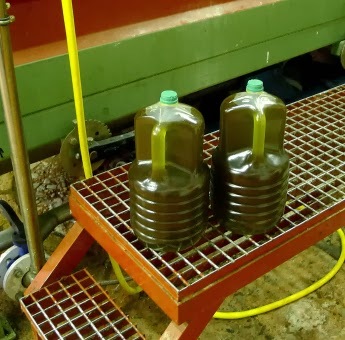 Jugs of new olive oil. As it happens (once in a thousand years or so), this Thanksgiving (Thursday, November 28) is also the first night of Hanukkah, the Jewish festival of lights, when it is customary to eat fried foods. So. Let’s bring this all together now! Sweet potatoes, olive oil, Thanksgiving, Hanukkah! Good times! Celebrate! Frying caramelizes the sugars in sweet potatoes. 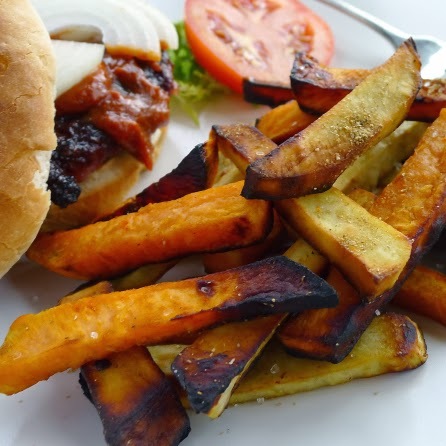 Serve these sweet-savory fries alongside a hamburger dolloped with some harissa-ketchup. Or, how about a turkey-burger and cranberry ketchup for a casual take on traditional Thanksgiving foods? Burger and sweet potato fries. 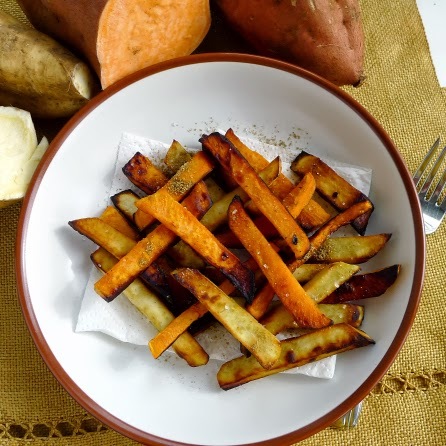 Peel the sweet potatoes, cut them as for “french” fries. Heat olive oil in a skillet to a depth of 1 ½ inches. Fry the potatoes until they are golden-brown and tender (about 8 minutes). Drain on paper towels. Sprinkle with salt and ground cumin. 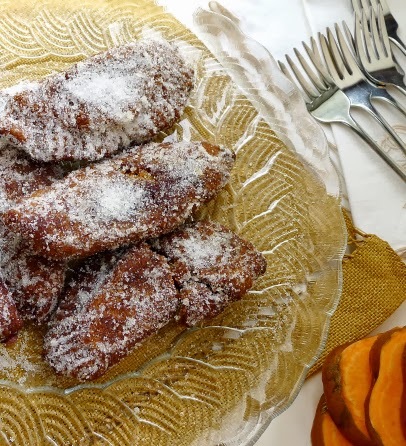 Fried turnovers are filled with sweet potatoes. These small fried pies could definitely fill in for good-ole pumpkin pie. And, take a flavor hint—aniseed, clove and cinnamon are marvelous with sweet potatoes. Roll out the dough very thinly on a lightly floured board. Prick the dough all over with a fork. Use a 4 ½ -inch cookie cutter or the rim of a glass to cut circles. Working with one disk at a time, place a spoonful of jam on one half. Moisten the edges of the dough with water, then fold the circle in half, enclosing the filling. With fingers or the tines of a fork, crimp the edges together firmly to seal the turnover. Place on a tray. Continue filling and shaping the remainder of the dough. Heat oil in a deep skillet to a depth of at least 1 ½ inches. Fry the turnovers, four or five at a time, until they are golden brown on both sides. Remove and drain on paper toweling. Sprinkle them with the sugar. 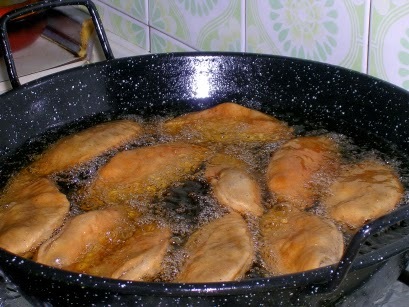 Filled turnovers are fried in oil. Heat the oil in a small skillet with the lemon peel. Remove from heat, cool for 1 minute. Remove and discard the lemon peel. Then stir in the sesame seed and aniseed. Pour into a mixing bowl and allow to cool. Roll out very thinly (less than 1/8th inch) on a lightly floured board. Shape and fry as in the following recipe. Fried pies are filled with sweet potatoes and sprinkled with sugar. This sweet paste, used to fill the turnovers, can also be rolled into balls and served as a “candy.” You will need about 2 ½ pounds of sweet potatoes to obtain 2 cups of cooked pulp. Cook them until tender, drain well, then mash or put through a sieve. 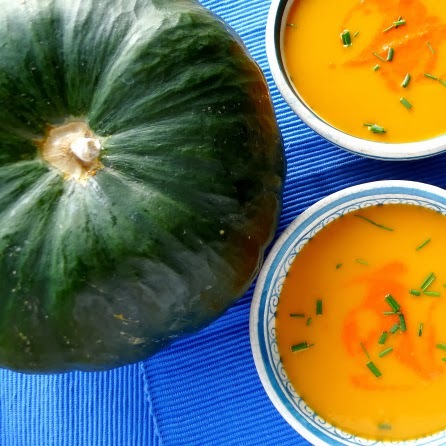 Pumpkin or other squash can be used instead of sweet potatoes. Place in clean jars and seal. Cool completely, then refrigerate. Keeps for several weeks. Years ago, before my kids were born, I lived in a rustic mill house in the country, with no electricity and no running water. Or, I should say, the running water came from a rushing stream, carried to the house in buckets. When I eventually built a new house in a small olive grove, I installed both water and electricity. No more kerosene lamps! No bucket showers! I immediately went out and bought myself an electric blender, a Braun Minipimer. 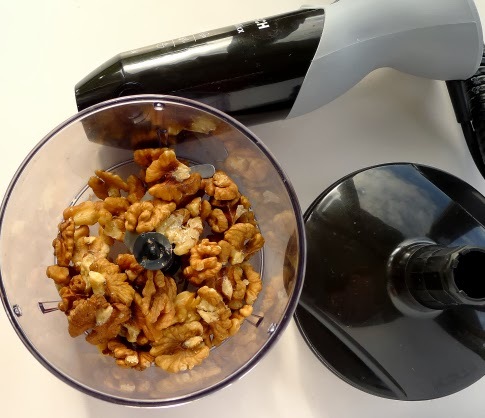 A hand-held immersion blender, it was at that time a “revolutionary” new design. After twenty-five years—and much gazpacho, baby-food purée and mayonnaise—my blender finally gave out. 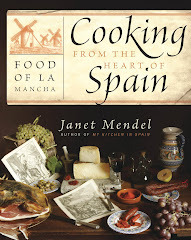 I was right in the middle of testing gazpacho recipes for the cookbook, My Kitchen in Spain. So I went right out and got another, basically the same Braun blender, 300 watts. But this one came with an additional attachment—a mini-processor for chopping. Meanwhile, my good friend Charlotte was having her own blender dilemma. She was devoted to an old Osterizer (600 watts), brought from the US and run with a transformer on Spanish current. When the glass container broke, she was devastated. 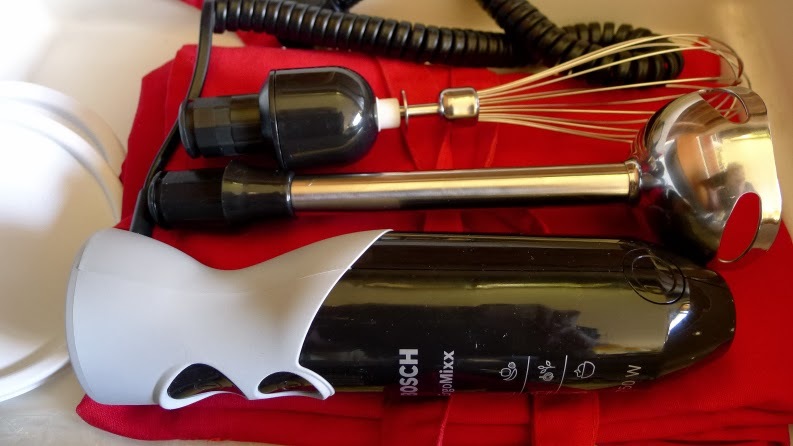 She had a practically new Braun immersion blender hanging in her kitchen. Even though I raved about it, she resisted using it, claiming nothing was as good as the Osterizer. So I went blender shopping. I found a new Osterizer for Charlotte, manufactured for European current. Although she was heard to say, “well, they don’t make them the way they used to” (plastic where the old one had metal), she seems delighted. My new kitchen tool--a Bosch blender and mini-processor. 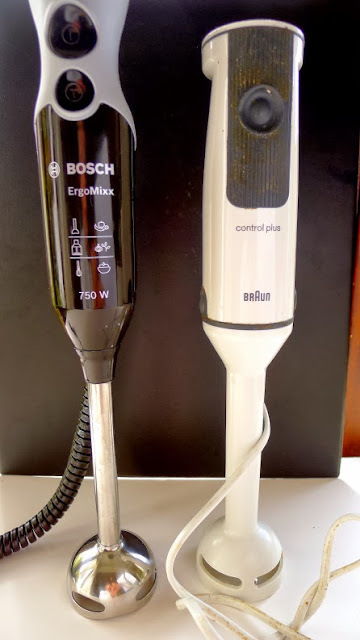 And, for myself, I found on sale a Bosch combo immersion blender, mini-processor/chopper plus whip attachment. With a whopping 750 watts, it will even grind ice. Puréeing beans for bean-kale soup. Puréeing mangos with yogurt for ice cream. 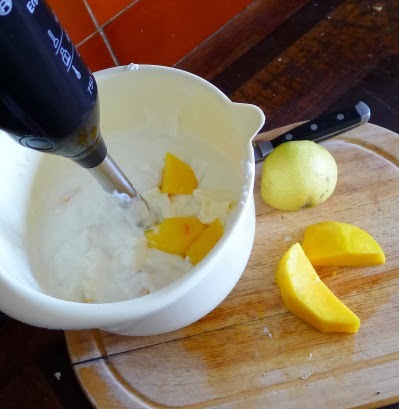 puréeing mangos with yogurt for “ice cream” (recipe). I still haven’t tried out the whipping attachment. Are meringues coming up next? Oh, in my appliance nook are also a standing mixer, a Sunbeam Mixmaster that is more than 40 years old, which I pull out whenever a birthday cake is on the horizon, and a hand-held mixer which I never use. I’m pleased with my new equipment, although I don’t really need such high wattage (300-400 watts is adequate for making gazpacho and most purées). 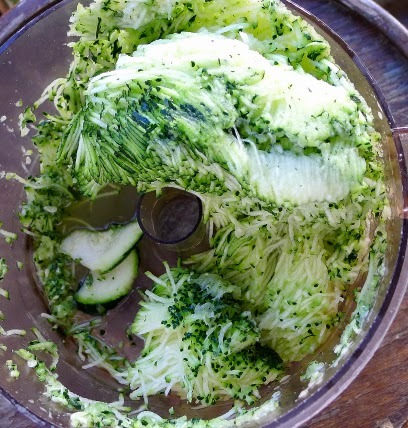 Shredded zucchini for savory flan. So, it looks like it’s retirement for the good old Braun. But, the old Moulinex processor, with its cracked food bowl repaired with strapping tape, stays, as I like the grating disk—perfect for shredding zucchini and grating cheese for a zucchini flan (recipe ). I’m hoping that the life expectancy of the new blender is at least as long as the one it replaces. In my kitchen, it gets almost daily use. Or, is there a Thermomix in my future? 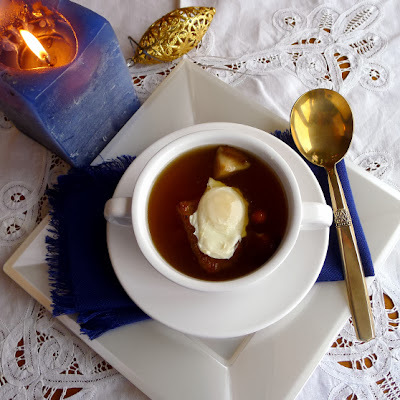 Pumpkin soup with chopped apple. A plethora of pumpkins! 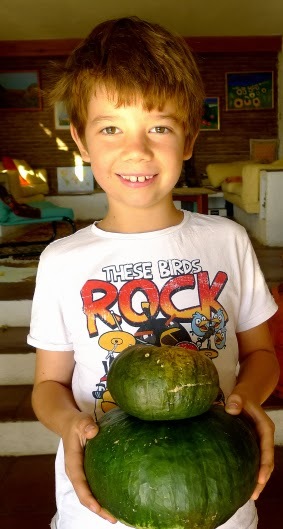 I’ve got some green pumpkins with orange flesh raised in the garden by son Ben and grandson Leo and some butternut squash brought to me by my gardener, Juan. So, I’m flipping through my files, searching for pumpkin recipes. Some I will steam until tender, then puree and freeze the flesh for making pumpkin pie and pudding for holiday meals. I’ll be making some more alboronía, a pumpkin and chickpea stew (that recipe I posted only a few weeks ago). 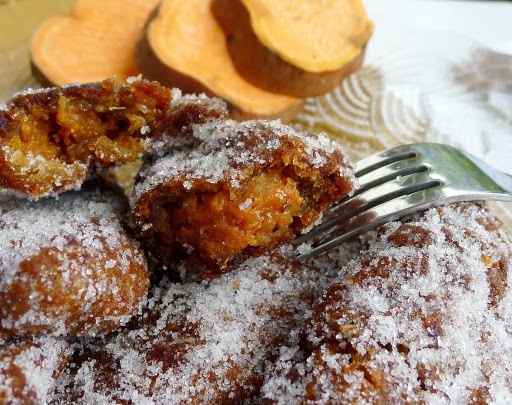 And, calabaza frita, “fried pumpkin,” an old-fashioned Andalusian recipe. 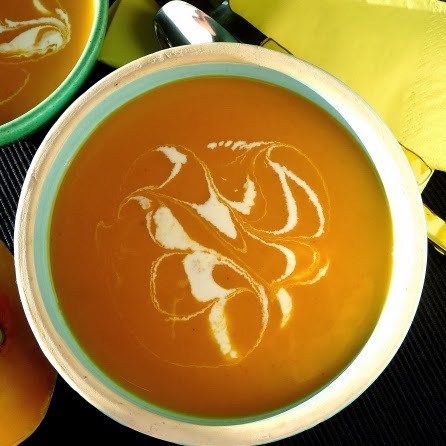 But, here’s a great rendition of pumpkin soup. 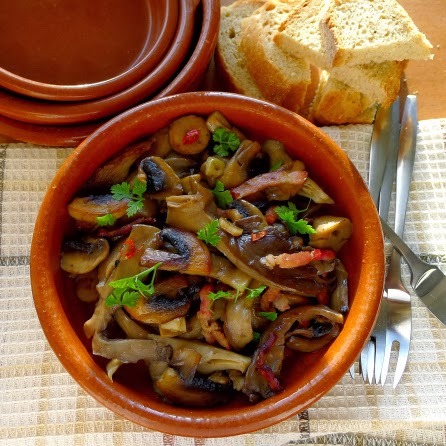 This recipe is adapted from one given to me by Carlos Falcó, Marqués de Griñón, who makes superlative vino de pago, single-estate wine, at Dominio de Valdepusa, in Toledo province. 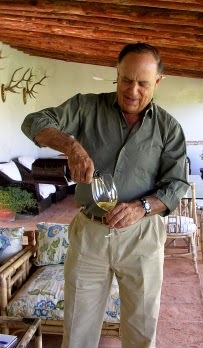 The Marqués pours wine at lunch. This soup makes an elegant starter for a holiday dinner. You can change its basic personality by swapping the finishing garnishes. Add color with a swirl of red pepper puree. Add texture with pomegranate seeds or toasted almonds. Make it richer with a dollop of Greek yogurt or cream. Turn it into a delightful vegetarian main-course meal by adding cooked brown rice and grated cheese. Swirl cream into the pumpkin puree. Red pepper puree and chopped chives to garnish the soup. I used butternut squash for the soup. Squash, carrots, red bell pepper and leeks make a very sweet soup. A touch of Sherry vinegar balances the flavors. Homemade chicken stock is best, but canned broth can be substituted. 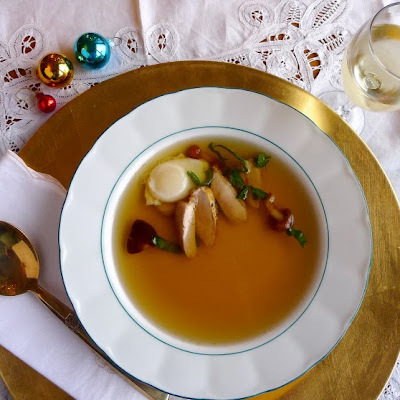 My stock was made with the addition of a chile pepper, which, I must say, added a lot to the finished soup. How much salt you will need depends on how much salt in the stock. 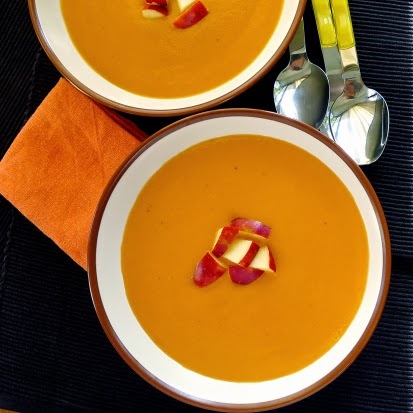 Roasting the pumpkin and bell pepper before incorporating them in the soup adds an extra dimension of flavor and makes it easy to peel them. This step is optional. I use an immersion blender to purée the soup. 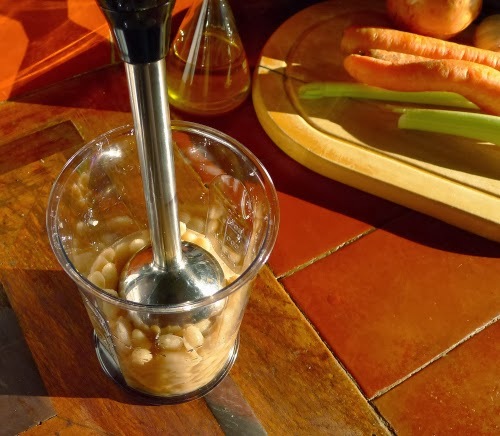 Passing the purée through a chinois sieve makes it especially smooth and creamy. 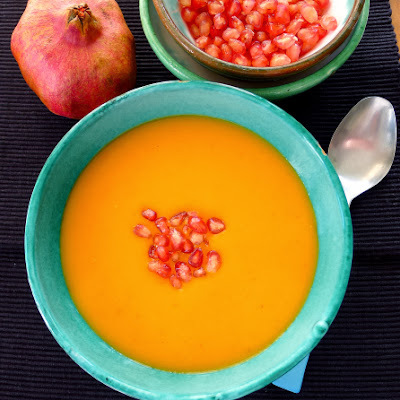 Pomegranate seeds add color and crunch to a smooth soup. Heat the oil in a soup pot and sauté the leek, carrot, and pepper on medium heat for 5 minutes. Add the garlic and pumpkin and sauté 5 minutes more. Add the potato, stock, vinegar, orange zest, thyme, bay leaf, cloves, cumin and salt. Bring the soup to a boil, cover, and simmer until pumpkin is very tender, 25 minutes. Remove the orange zest, thyme and bay leaf. Purée the soup in a blender. Sieve it, discarding any solids. Taste for salt. If desired, thin the soup with milk or cream. To serve, reheat the soup without allowing it to boil. Garnish with diced apple.